President-elect Donald Trump says he will remove himself from his business "completely" to avoid conflicts of interest. Authorities on government ethics and law say that's not enough. In a string of tweets Wednesday morning, the president-elect said he would leave the Trump Organization to focus on running the country. He promised to talk about it at a "major news conference" on December 15. His full plan is not clear, but he said his adult children will be there. He has previously said he will let them run the company, even though they are advising him on the presidential transition and have taken part in meetings and phone calls with world leaders. "There is no reason to think, based on anything we've seen so far, that this little Twitter blast suggests anything serious," said Steven Schooner, a professor of government procurement law at George Washington University. Trump said legal papers are being drawn up to "take me completely out of business operations," but he did not say he will sell anything he owns. He is exempt from federal laws that prevent other officials of the executive branch from holding assets that clash with their official duties. His holdings could present serious conflicts while Trump is president. He has business interests in more than two dozen countries, each with complex relationships with the United States, from trade to human rights abuses. Ethics advisers to previous presidents say Trump can't just step away from the organization if he wants to avoid them -- he'll need to relinquish ownership as well. In a statement Wednesday, two of those experts, Norman Eisen and Richard Painter, said Trump should divest ownership of the Trump Organization using a blind trust or equivalent. That would mean selling his assets and putting the proceeds in the hands of a trustee who manages them without his knowledge. Trump has not suggested anything close to that. "Otherwise," they wrote, "he will have a personal financial interest in his businesses that will sometimes conflict with the public interest, and constantly raise questions." Eisen is a visiting fellow at the Brookings Institution who led ethics initiatives in President Barack Obama's first term. Painter was the chief White House ethics lawyer for President George W. Bush. Unless Trump gives up ownership, "he will have an interest in the foreign government payments and benefits that flow to his businesses daily," they wrote. 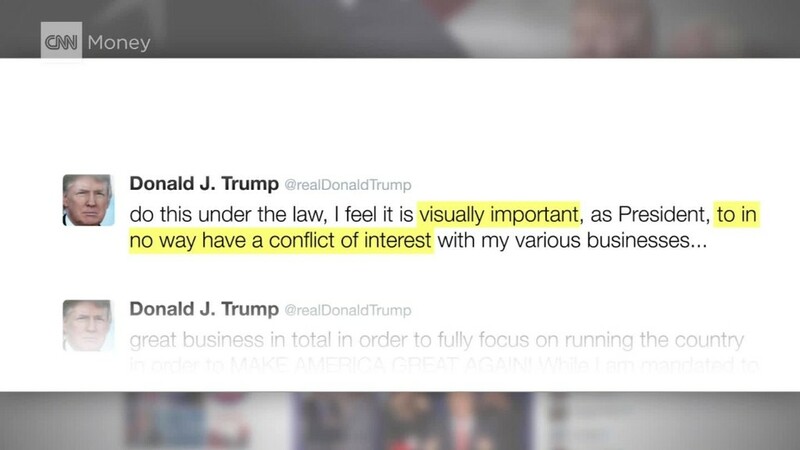 "That creates such a serious conflict of interest that the framers of the Constitution prohibited it for the president in the Emoluments Clause." That clause prohibits the president from accepting gifts from foreign governments unless authorized by Congress. Others experts have said Trump's proposal to cede control of his business to his children could be sufficient, as long as certain protocols are met. David Rivkin Jr., an attorney who worked in the Justice Department under Presidents Ronald Reagan and George H.W. Bush, told CNNMoney last week that White House lawyers could step in to review potential problems. For example, he said, Trump would have to talk to the White House counsel office if any of his children wanted to talk to him about policy questions that could have implications for the business. So far, there is little indication that Trump wants to keep his children at considerable distance. Ivanka Trump sat in on the president-elect's first meeting with a foreign head of state, and the three adult children and Trump's son-in-law are all part of the transition team. In their statement Wednesday, Eisen and Painter said Trump should set up an "ethics firewall" if his family is to remain involved in the business. Trump's first move, they said, should be having the children step away from the transition.